The greatest benefit of eStockCard is allowed you to track each inventory with their unique serial number. 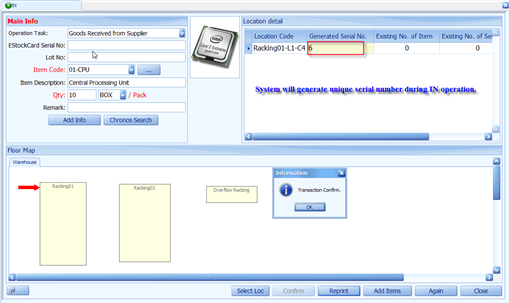 After the item has been stored into your warehouse or storage location by IN operation, unique serial number will be automatically generated by the system and bar code label will be printed and pasted onto that item. You can track it in an effective manner (item code + unique serial number) under all other operations such as OUT, LOCK, UNLOCK, CYCLE COUNT, PICKING & SALES ORDER. During receiving, put away or retrieval processes, you are generally required to enter numeric or alphanumeric information such as item code to your inventory control software, spreadsheet, proprietary software or accounting software. However, numerous human errors such as typo error and this will result wrong information or data to be entered if item codes have high degree of similarities. Significant and substantial amount of efforts are required to rectify it. 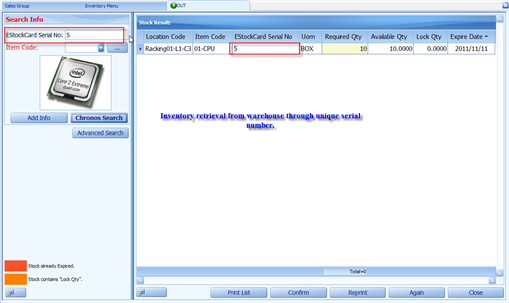 One of the unique feature that deliver by eStockCard is to display the item’s image before data is entered and confirmed. This will greatly improve the accuracy of put away or retrieval. Shelf life is the length of time that food, drink, drug, chemical, pharmaceuticals or medicine are given before they are considered unsuitable for sale or consumption. It is the recommendation of time that products can be stored, during which the defined quality of a specified proportion of the goods remains acceptable under expected (or specified) conditions of distribution, storage and display. Stringent shelf life control is significant importance and crucial in many industries such as pharmaceutical, food, drink, chemical and meat distribution to ensure their products are keeping at best freshness and without degrading to unacceptable levels. 1. Identifying and maintaining a database of all items that have “Shelf-Life Limitation”. 2. Able to capture all appropriate information, such as lot no, batch no, receiving information, expiration date, manufacturing data and many specific information. 3. What products in your inventory have a limited shelf life and quantities on hands. 4. Monitor those products with a scheduled frequency that will ensure that no product will remain in stock or be issued beyond its shelf life. 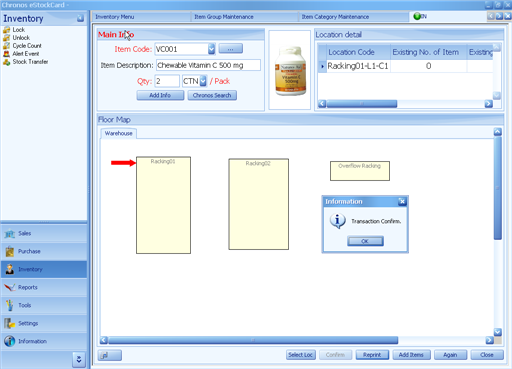 Step 2 You can view date-to-expiry, already-expired products during retrieval process. In property investment, the most important factor is: location, location, and location. In Warehouse Inventory Control, to me, the most important function is: accuracy, accuracy, and accuracy. How many to buy?… and so on. 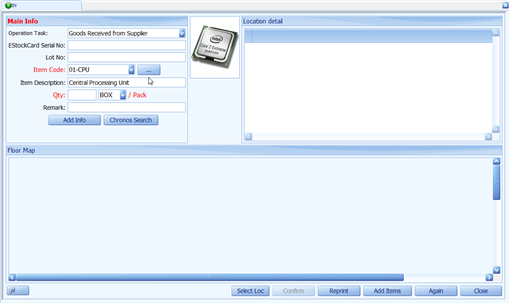 Record all inventory movements — receiving (IN), delivery (OUT), transfer, disposal, adjustments etc. Do Cycle Counting (stock take) frequently and randomly (by another group of staffs other than local storekeeper). Maintain good housekeeping at the stores or warehouses — 5S approach is the best. If possible, please invest in technologies such as inventory software, barcoding system and racking infrastructure to minimize operation errors. And finally, train your operation staffs to be more discipline. How much does it cost to your organization if the productive machine is not working as promised? It could be very costly and expensive to the organization and deteriorate the level of customer satisfaction and may severely impact your organization bottom line. Hence, effective spare parts inventory management plays a vital role in achieving good machine and asset availability at an optimum cost. It has been common in many industries that the non-availability or inappropriate of spare parts, as and when required for repairs, contributes to as much as 50% of the total down time cost. It is a paradox to note that the maintenance department is complaining of lacking of appropriate, right quantity of the spare parts to meet their maintenance requirement and finance department is facing the problem of increasing locked up capital in spare parts inventory due to over stocking or spare parts obsolescence. 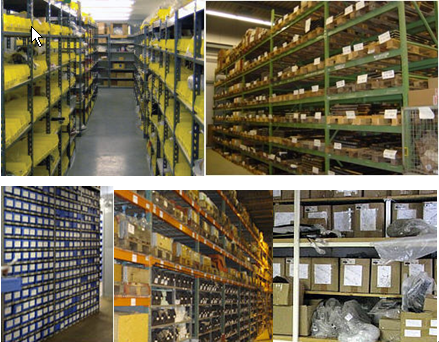 This further signifies the vital importance of spare parts inventory management in many organizations. Firstly, there is an element of uncertainty as to when, what and quantity a part is required. This is due to the fact that the failure of a component can not be predicted accurately. Secondly, spare parts are not easily and widely available in the market as they are not fast moving or commodity items. Additionally, due to technology advancement, new spare parts are introduced to incorporate the design improvements and old spare parts are phased out. Obsolescence is the common problem due to old spare parts is not fitted. Thirdly, the number and variety of spare parts are too large making the close control more and more tedious and difficult without the installing of good and proper inventory tracking system. 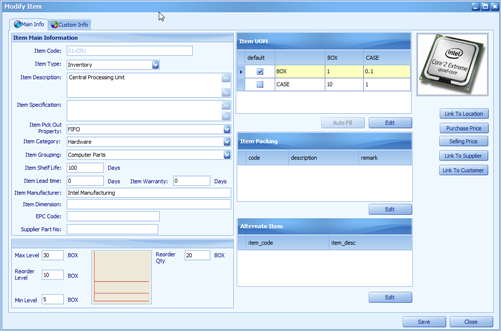 Fourthly, no proper spare parts inventory analysis tool in place to carry out analyze on different characteristics of the spare parts, such as annual consumption value, criticality, lead time, unit cost and the frequency of use; It is crucial to help the company in establishing suitable control policies. The objective of spare parts inventory management is to ensure the availability of spares for maintenance and repairs of the plant and machinery as and when required at an optimum cost. Prior to develop viable and effective inventory control policy and procedure, it is essential to analyze the inventories based on various characteristics such as the frequency of issues and use, the annual consumption value, the unit price, the scarcity and lead time. This is essential as it would not be possible to exercise the same type of control for all items and it may not really be effective. Inventory analysis and adequate classification aids selection of proper policies to achieve better in control. F, S & N stand for Fast moving, Slow moving and Non moving items. This type of classification helps to establish and organize proper warehouse layout by locating all the fast moving items near the dispensing window to reduce the handling efforts. Also, attention of the management is focused on the Non-Moving items to enable decision as to whether they are in needs in the future or they can be salvaged or disposed. This will help to improve organization’s capital utilization and cash flow. Another method of classifying inventory is on the basis of annual consumption value. Pareto’s principle can be applied to classify inventories based on consumption value. Pareto principle : The significant items in a given group normally constitute a small portion of the total items in a group and the majority of the items in the total will, in aggregate, be of minor significance. This way of classification is known as ABC classification. CLASS A: 10% of total inventories contributing towards 70% of total consumption value. CLASS B: 20% of total inventories which account for about 20% of total consumption value. CLASS C: 70% of total inventories which account for only 10% of total consumption value. * Control by top executives. * More items from same supplier. This type of classification helps in implementing proper control such as authorization, expiry management; identify opportunity to find out a less expensive substitute. Difficult (D) = Items which require more than a fortnight but less than 6 months’ lead time. This type of classification helps in reducing the lead time required at least in case of vital and essential items. Ultimately, this will reduce stock-out costs in case of stock-outs. Inventory tracking is the fundamental process within the firm. Good and efficient inventory tracking system provides the firm with quality and timeliness data which ultimately improve operational efficiency and bottom line. eStockCard is developed with very simple objective – We wish to provide the best tracking capability to firms in managing their products, parts or items within their warehouse or storage location. Very simple and highly flexible and customizable IN screen. Just enter item code and quantity. System will automatically search for the best storage location. Alternately, user can configure manually. Auxiliary information can be entered as optional such as batch, lot, expiry, manufacturing date, PO, WO. Item’s picture can be retrieved to increase efficiency. Barcode scanner can be used to reduce human error. Very simple and highly flexible and customizable OUT screen. Just enter item code and quantity required. Picking process is completed. Real-time information such as what, where, how much. Products/Items moving frequency (slow moving, fast moving). A simple inventory tracking software, with serialization capability from Chronos eStockCard, enables small and mid-sized companies to manage and track their products beyond their four walls. Technology-advanced solutions such as RFID can be very costly and not viable for many companies. Paper and pen recording can be ineffective and inaccurate. By switching to eStockCard, you just need a piece of barcode label and unique serialized number will be generated for tracking purpose from receiving until delivery. 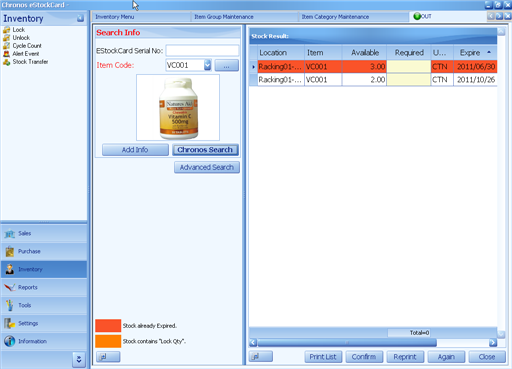 For limited shelf-life products or items, the unique identifier that generated by eStockCard can be used to determine the end-of-life (EOL) of the products and this will help to facilitate the put-away and distribution processes. Automatic alert triggering system is embedded to help firms to identify and segregate the about-to-expire products. Many powerful reporting are built and allow firms to trace product’s history and movement. 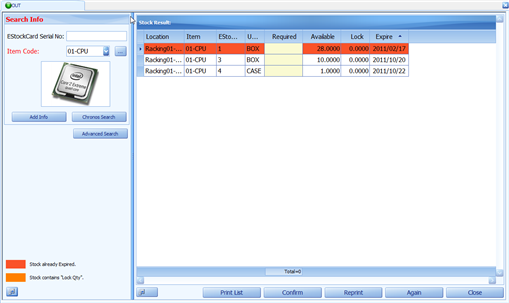 At Chronos, we believe this superior inventory tracking software will help you to achieve better control. You can download the Free Edition immediately for trial. Effective sample management is critical and important for many industries, for instances, food and beverages, chemical and pharmaceutical industries, just name a few. Samples are used and referred during receiving and inspection, production and quality control management. Hence, proper and effective sample management system and procedures must be established within the organization to keep track of the flows, quantity, expiration of the physical samples. eStockCard, being one of the most powerful inventory tracking software, has been deployed successfully in several chemical coating companies with the prime objective of achieving excellent sample management. The simple and easy-to-use IN and OUT screens will help to record the movement and flow of the samples. 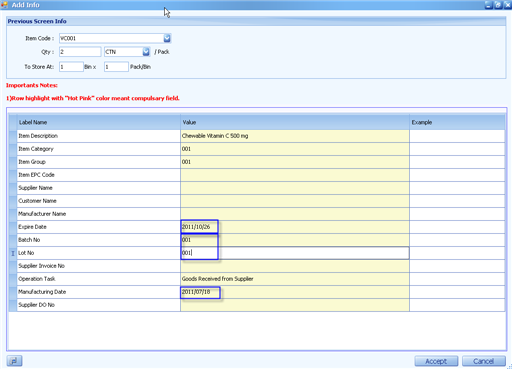 You can enter auxiliary information such as batch or lot numbers, EOL (end of life) and many more for further analysis. Simple but powerful and resourceful reporting function will provide user with greater visibility of its validity, quantity, movement, history, where to store and more. Intelligent alerting module will trigger and alert user automatically for any about-to-expire sample. This is essential for good quality management. Comprehensive barcode design and printing feature is embedded to help to simplify data entry and reduce human error. Customizable screen layout capability is another value-added feature which allows user from diverse industries to customize their screen layout and further improve their operational efficiencies.